Carrying on from the previous post ... I needed OCPM 1.0RC1 in my lab to test with OCUM 6.1. Again, I’ve got a vSphere ESXi 5.5U1 standalone host and a vCenter Server 5.5U1. And again, OCPM 1.0 is free, no license is required. There’s nothing in the IAG about a lesser configuration. So, for my lab (using the previous post’s experience), I’ll give the ESXi host 12 GB RAM, 2 CPU cores, 4 GB Disk Space - for the ESXi install - plus a 50 GB thin-provisioned disk for OCPM 1.0. And for OCPM 1.0 - 8 GB RAM (keeping the reservation on), 2 CPU cores (no reservation), and use thin provisioning. Browser: IE9 and IE10 - for IE ensure Compatibility View is disabled and Document Mode set to the default; Chrome versions 30 and 31; Firefox versions 24 and 25; and for all browsers disable any popup blockers. Note: OnCommand Performance Manager 1.0 RC1 OVF deployment doesn’t have the ‘Static Networking configuration’ section as part of the ‘Deploy OVF Template Wizard’. 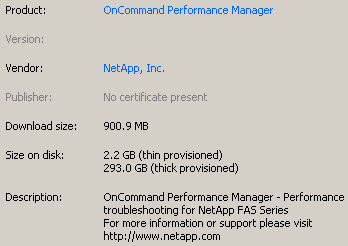 For a lab environment, you may want to adjust the OCPM 1.0 VM’s Virtual Machine Properties. Out of the box, OCPM 1.0 is configured with 12 GB memory and 4 CPUs. It also comes with a CPU reservation of 9572 MHz and Memory reservation of 12288 MB. Click the ‘Power On’ button to boot the OCPM 1.0 VM Appliance. Then it will try and configure via DHCP, and if not successful, it will prompt to retry DHCP, or set up a static network configuration. Select option 2 for ‘Set up a static network configuration’. 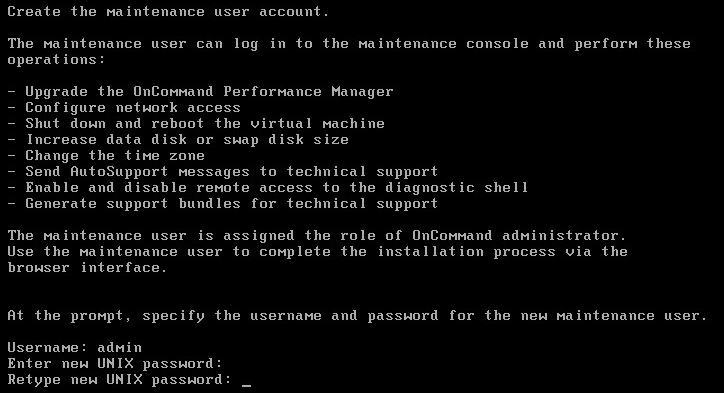 Image: OCPM console - DHCP or Static? The next prompts are for the username and password for the new maintenance user. And that’s it, we’ve deployed OCPM 1.0! 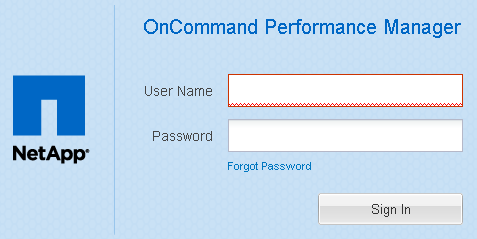 And can get to the login box via an internet browser at https://OCPM_IP_ADDRESS!